– The long promised changes to the Inheritance Tax threshold in the UK are now beginning to take effect. With such a long lead in, and the level of complexity surrounding the changes, there is still much confusion about who the changes affect, and how. But can you afford to remain in the dark? If your Estate – including your home – is worth over £325,000, you need to know how the Inheritance Tax Rules affect you. It could save you up to £140,000 in tax. Of course there’s no substitute for one-to-one expert advice on your individual circumstances, but here are a few pointers to prepare you for what to ask when you meet with your legal advisor. • The basic tax-free threshold will remain the same: £325,000 for a single person; up to £650,000 for a couple who are married or in a Civil Partnership. • Assets above the threshold will still be taxed at 40% (so, for example, if the outstanding value of your property is £75,000, the tax owing will be £30,000). • The new threshold covers only the family home, and only if it is left to your direct descendants (children; grandchildren; step-children; adopted children; foster children; spouses and civil partners of direct descendants who have not remarried). • The new additional ‘family home’ allowance threshold of £175,000 per person (£350,000 for a married couple) will not take full effect until April 2020. An additional allowance of £100,000 per person will take effect this year, rising by £25,000 per tax year until 2020. • If you have sold or downsized your home since 8th July 2015, you can still claim the full value of your previous residence against the new threshold. • The new tax-free threshold from April 2017 will therefore be up to £425,000 for a single person’s Estate; £850,000 for the Estate of a married couple or Civil Partners. • ‘Common Law’ spouses will continue to be excluded from the provision for passing on your allowance (there being no recognition of ‘Common Law’ marriage in UK law). So many of us put off making our Wills, or updating them, with an almost primitive level of superstition that we are somehow ‘pointing the bone’ at ourselves, hastening death. But changes in family circumstances, such as death, divorce, marriage or remarriage can render existing Estate Plans invalid or unsuitable. If you have a substantial Estate, it is recommended that you revise your plan at least every five years (and more often if you or your beneficiaries’ circumstances change). Perhaps you are aware of the Intestacy laws, and are happy for your Estate to be split between your spouse and your children; but have you considered the increase in IHT liability that could result? The new rules on IHT, with a separate threshold for the family home, make the issue of intestacy and tax even more complicated. You are not a direct descendant of your spouse, so if your spouse’s Estate is split between you and your/their children, only they can claim against the family home allowance. 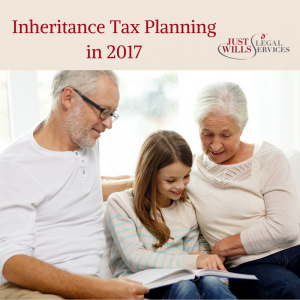 If your entire Estate is Willed to your spouse or Civil Partner, they will then also inherit your Inheritance Tax Threshold Allowance. This then passes to your children a combined tax-free allowance of up to £625,000. And with the changes now being introduced, the combined allowance will increase to £850,000 this year, rising to up to £1m by April 2020. If your Estate is split between your spouse and your children, IHT may be payable immediately on the entire sum that your children inherit. For example, if the Estate of your spouse is worth £500,000, and your spouse dies intestate, the first £250,000 automatically goes to you (after you have discharged the much higher legal and probate fees that often come with an intestate inheritance). The remaining £250,000 is split in half, with half going to you – the surviving spouse – and the other half to be divided between your children. So in effect, you have inherited £325,000 tax free. You have also inherited an additional £50,000 on which IHT must be paid at 40% – a tax bill of £20,000. While the value of your house may have risen, do you have liquid assets of £20,000, in addition to the legal costs of processing an intestate Estate? Your children, however, will inherit £100,000 tax free from April 2017, and then pay 40% tax on the remaining £25,000 – a total tax bill for them of £10,000. Remember, the tax is levied on the value of the Estate as a whole, not the value of each bequest. There can be further complications if you have gifted large sums or assets to family members within the last seven years, if you don’t currently live in the former family home, if the house is in the name of one spouse only, or if your Will stipulates that your property to be sold on your death. So don’t delay getting expert legal advice. Our network of consultants covers most of the UK and is growing every day, and we can visit you at a place convenient to you for an initial free consultation. If you’d like to book a free consultation with one of our legal experts, book online or call 01342 477 102 and quote ‘IHT April 2017‘.